King Tutankhamun is famously the only Egyptian pharaoh who still occupies his original tomb in the Valley of the Kings, and since 2007 his mummy has been proudly displayed in a smart, glass case. What’s less well known, however, is that this isn’t the whole King Tut: a tiny piece of his mummy was removed in 1968 and flown to Liverpool. When researching my book about Tutankhamun’s mummy, The Shadow King, I couldn’t resist tracking it down. The man who took this royal morsel was Ronald Harrison, anatomy professor at Liverpool University, UK, who was leading a project to X-ray the mummy in an attempt to determine the king’s cause of death. He was also interested in whether Tutankhamun was related to a mysterious royal mummy that had been found – dripping with gold but with the name scratched from its coffin – in a nearby tomb. A few years before, Harrison removed a toe from this mummy (dubbed “KV55” after the tomb in which it was found). In what was groundbreaking work for the time, his Liverpool colleague, a young postdoc called Robert Connolly, used it to work out the mummy’s blood group. Repeating the trick on Tutankhamun might reveal whether the two mummies were related. Harrison scraped off a piece of skin from Tut’s back, packed it into an envelope, and took it home with him. But Connolly was dismayed when he saw the sample. To determine the blood group of a human sample required a gram of tissue, about the size of a sugar lump. The Tut sample was just 10 milligrams – a hundredth of what Connolly needed. So he came up with an ingenious idea. He knew that the antigens that determine a person’s blood group can be persuaded to attach themselves to red blood cells, if you mix the two together. 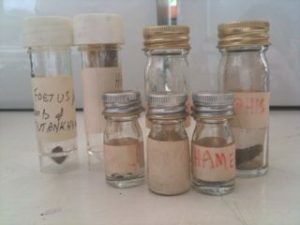 He decided to stick the antigens from Tutankhamun’s skin onto modern human blood cells, to give himself a larger sample to test. In effect, he would bring the pharaoh’s blood group back to life. It sounds simple, but it took months to make it work. Connolly himself was blood group O, meaning that his own cells would make the perfect clean slate for a mummy’s ancient molecules. He tried out his idea on an anonymous mummy held at the university. In an experiment that sounds like the plot for a horror film, Connolly took a tissue sample from the mummy, purified the antigens from it, and mixed them with his own blood. It worked, reviving the Egyptian’s ancient blood type and converting Connolly’s O blood into group A. Then Connolly moved on to the pharaoh himself, this time using control panels of modern blood helpfully provided by the Blood Transfusion Service (this was perfectly legal at the time, but it is no longer permitted to use donated blood for this type of research). He tested the Tutankhamun-ized blood and found it was group A too, or to be more specific, A2/MN. Studies of other mummies suggested that this was a rare group among the ancient Egyptians, but it was exactly the same as that of KV55. It was strong evidence that these two individuals were closely related: Harrison concluded that they were brothers, and that the anonymous royal was a pharaoh named Smenkhkare (Egyptologists still argue over whether he was right). Connolly’s ingenious technique earned him and Harrison a paper in Nature and over the next few years, they built up a collection of samples from various relatives of Tutankhamun, including two tiny foetuses discovered in the king’s tomb. Connolly is now in his seventies and an honorary lecturer in anatomy at Liverpool University. As the last surviving member of Harrison’s team, he is the guardian of all the X-ray images and tissue samples from the Tutankhamun project, so I take the train to Liverpool to see him. “I’ll be wearing a brown suit with yellow tie and pocket square,” he texts, and meets me on the platform, holding a copy of the British science journal Nature. His office in the anatomy department is a little box of a room with a sloping ceiling and walls lined with crowded bookshelves. On his deep, dusty windowsill, a collection of blackened skulls sits just behind the kettle. Around the room, family photos are interspersed with boxes of tiny bones, old-fashioned Cadburys tins, a picture of an armadillo, and a box of Royal Ceylon tea. So, do you want to see the bits?” says Connolly, eyes twinkling. He opens a drawer in a small chest on his worktop and pulls out a thin cardboard box, inside which is a collection of glass screw-cap tubes with yellowed labels. One of them says Smenkhkare, but it’s empty – a few years ago, Connolly gave this mummy’s toe back to the Egyptian government. Then the one I’m looking for, scrawled with the name of Tutankhamun, containing what’s left of the sample that Harrison brought home from the Valley of the Kings more than forty years ago. Today, it’s unthinkable that a British professor could walk off with such a prize. The Egyptian authorities are understandably very defensive about their heritage being taken abroad, and it’s illegal to remove any archaeological sample from the country – particularly from something as precious as a royal mummy. I peer into the tube, and right at the bottom I spot some tiny brown-black fragments of Egypt’s most famous ever king. They look just like toast crumbs. There’s more on the secret history of Tutankhamun’s mummy in The Shadow King, which is published in the US today, and in the UK on 27 June. Sorry mate but no banana for you. Much falsehood has been infiltrated into the teachings of the first prophets up to Jesus, and that is where much of the confusion comes from. However a thorough study of the Q’ran which does not suffer from any lack of credibility or contemporary sources for comparison. When you understand what you’re writing off with this glib interpretation of some mere questions about what Islam already decrees to be seriously flawed history and teachings due to deliberate pollution with ideas of men and politics come and try again. First off, this looks like a good website and interesting subjects. Something new to discover. Thanks! About Tut’s tomb being a “repository for the regalia of the cult of the Aton”, I am not sure Andis Kaulins makes that assertion at Lexiline. I think he states the evidence leans towards it being the repository of Ramses II’s treasure, the pharaoh he alleges is the biblical “Solomon.” Placed there by Hezekiah when Nebuchadrezzer was looting Egypt and it’s treasures. (The “Mishnayot” is where he finds this evidence). I disagree, I think Amenhotep III is the real “Great Solomon” king…and is Tut’s grandfather. However, Ramses II may be the “biblical” role model for Solomon.” Further, I have real chronology problems with “Nebuchadrezzer I conventional timelines”….WHO WAS THIS GUY??? His wife’s name, please?? His family? Father, mother, brothers and sisters?? Anyone??? Hezekiah, was the 4th king of Israel, and clay bullae has been discovered with his royal seal, and the image of the Aten and of the “Kheperu” scarab beetle image. “Kheperu” (silent K according to Velikovsky, making it Heperu/Hebrew, the “Golden Horus” title of many pharaohs of the 18th dynasty, including Tut). I think it is not accurate to label the Amarna kings as “Jews”, rather they were “Hebrews” and Levites. As Ahmeed Osman points out: Akhenaten (whom Kaulins alleges is the prophet Nathan and king Saul/Sol, the sun king) built his city Akhetaten directly across the Nile from the city of the Levites….not a coincidence. Curiously, over in India during the 14th century BC, was a kingdom called “Puru”…and one of their kings was named “Yuyuti.” Brother of “Dhritarashtera. I say this is “Egyptian vizier Yuya” (daughter named Tiye), which Amenhotep III named his “double” and proclaimed all Egyptians must “bow the knee” to, is Yuyuti, and his brother is “Tushratta”/Dhritarashtera. Kings of India. Indian/European (Aryan) military overlords of Babylon, Assyria, Hatti and Egypt for a long period of time. Vedic. Brahmin king/priests (Abram/Abraham). Istar Devatta worshipers. Istar’s Harp=David’s Harp. Venus, Istar’s astrological symbol, becomes the Star of David (I star Devatta). “Jews” come from India, ask Josephus. Andis Kaulins states Sobekmzaf II is the “original” role model for the biblical “Moses.” Perhaps so. Akhenaton is for sure the biblical Moses role model. Now, go to Wikipedia, and learn something “odd”: Why does mainstream archaeology and it’s sources write “Ahmose I” in that manner, when they KNOW it is really “IaMose/YaMose”: Born of the Moon? To hide the fact Ya/Yahweh is the Egyptian Moon God? I don’t know who you are, but this person (a woman? a hermaphrodite?) does NOT look like Tutankhamen – IN THE LEAST! Stop trying to fool us, the readers! That person does look like Barbara Streisand, though. Hardly, the look of an Ancient Egyptian!. Can the writer please contact me, I have info, that will mean a whole new book. I am not a writer, so I am offering my research for a book, for a %. It will blow away all other books!